Following -- quite literally -- in the footsteps of "Revisions," "Lifeboat" relies more on story than special effects to keep the audience entertained. Unlike the previous episode, however, "Lifeboat" had an extra emotional element to lend it appeal. Although the episode obviously focuses on Daniel Jackson's "possession" by the consciousness of several individuals from a crashed ship, a great deal of the real emotion is predominantly embodied in the characters of Janet Fraiser and Pharrin. Voices in our heads aside, it is the plight of these characters that we can most relate to: one friend worried about another, and a parent trying desperately to keep a child safe. Both performances were superbly handled by their respective actors; in fact, it was arguably the best episode for actress Teryl Rothery since Season Five's "Rite of Passage." Michael Shanks carried much of the episode in terms of screen time and lines, although the percentage of the episode he spent actually playing Daniel Jackson was minimal. Most of the time he bounced between a handful of personalities, some named and some not, some helpful and some ... less so. And the fact that many of these consciousnesses were aware of their situation, the presence of the others, was an eerie touch. Some of the episode's early split-personalities scenes were a bit overdone, and sometimes even humorous (which was surely unintentional) to the point where it interfered with the telling of the story. However, the actor settled down and regained his footing in the second half as the plot picked up speed and the mystery began to deepen. "Lifeboat" was another episode where the current lightness of Richard Dean Anderson's schedule was painfully obvious. While his trademark attitude was present and accounted for in the teaser, Jack spent most of his time unconscious in the infirmary or watching Daniel play Personality Ping-Pong from another room. The saving grace with regards to the character, however, is the final scene in which he pulls Pharrin up by his bootstraps and convinces him to disobey his Sovereign. One of the most illuminating facets of the episode was the series of flashbacks that showed what had transpired on board the ship before it crash-landed. Being able to put a face to some of the names and personalities -- such as Pharrin's son -- gave them more depth and character, and made them easier to "see" when they were being played by someone else. (It might have also been interesting to see, in flashbacks, the way the Sovereign interacted with the other, common crew members.) Seeing the vessel staffed and functional gives the setting an especially creepy quality when transposed with the ghost ship that SG-1 discovers. What's great about this episode: The story. While Stargate has done "team member is possessed / driven crazy" more than once -- and even more than once with Jackson in that role -- there was something about this story that made it different, and far more poignant. It wasn't just about the others' reaction to their mentally unstable colleague, it was about what had happened to the crew of the crashed ship, how they could be saved, and at what cost? The emotion: Teryl Rothery's performance shows why she should be in the opening credits, and why, in the hearts of most fans, she already is. What's not so great: There are still some unanswered questions at the end of this episode -- as there always are. How long had the ship been on that planet, and how long had Pharrin been living there with his multiple personalities? How was Pharrin ultimately able to absorb the consciousness of his son, the Sovereign, and the others, when he was already carrying a dozen souls and didn't believe he could hold many more? Why did Teal'c recover so quickly from Pharrin's assault? And last but not least, how will Pharrin be able to deal with his multiple-multiple-multiple personalities without going completely, absolutely bonkers? Science fiction television tends to re-use storylines, and Stargate SG-1 is no exception. 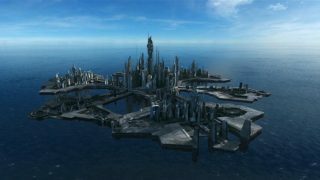 "Lifeboat" was based on a standard premise, but despite the familiarity the treatment of this story is quintessentially Stargate. The writing and acting were superb; Brad Wright, Teryl Rothery, Michael Shanks, and guest star James Parks showcased their considerable talents, pulling off this episode with panache. "Lifeboat's" curtains rise on board a crashed alien vessel, the Stromos. Flashlight beams scan the dim interior, dust floats in the air, strange pods have people inside them in suspended animation ... a wonderfully tense atmosphere is created before a word is spoken. Seeing no immediate danger, O'Neill orders a count of the bodies. And that's where the trouble begins. The team are knocked unconscious. When they are brought back to the S.G.C. -- O'Neill and Carter still not awake -- Daniel exhibits peculiar behavior: muttering that he must go back, shrinking away from Teal'c. It seems Daniel has various personalities inside him, possibly as many as twelve of the Stromos' passengers. This initially appears to be the straightforward story of how SG-1 and Dr. Fraiser work together to evict the squatters from Daniel's mind. But it's never that simple with writer Brad Wright, and moral issues lurk in dark corners. The individuals inside Daniel cannot be returned to their own bodies because their bodies are dead. In a very real sense these are souls, disembodied consciousnesses that have nowhere to go. Should SG-1 be bartering with the lives of the remaining passengers? What would Daniel have to say on the matter? Since Daniel will go insane if the personalities remain, is there even a choice? Disappointingly, these questions aren't addressed; the focus instead is on SG-1's single-minded determination to get Daniel back.The personalities within Daniel (three in particular) give an insight into a civilization that is now all but destroyed. Martice -- the first personality we meet -- is the Sovereign, haughty, angry, and prone to fits of pique (providing some of the episode's best lines); Tryan is an engineer, practical, calm, resigned to what has happened; Keenin is a boy, perhaps eight years old, confused, scared, and miserable. In dealing with these personalities, Dr. Fraiser demonstrates a vast range of emotion, teasing out vital information, dealing with tantrums, and caring for her patients while keeping an anxious eye out for the appearance of Daniel himself. And that's a significant point. 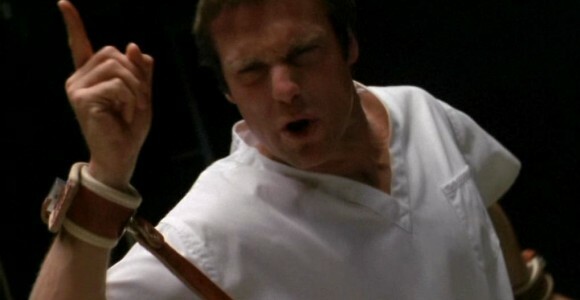 Although Michael Shanks played a big part in this episode, Daniel Jackson himself surfaced only once, his consciousness having retreated into coma to keep itself intact. The characters in Daniel's head were individuals in their own right, unique in their speech, mannerisms and expressions. So unique, that I disliked Martice intensely, loved Tryan, and worried for Keenin. "Lifeboat" first deals with the personalities in Daniel, and second finds a solution to the problem of removing those personalities from his mind. Major Carter slips into her role as problem-solver without hesitation. She must save a friend, and she diverts her worry into that endeavor as she has done on many occasions. Teal'c holds vigil over Daniel while he's under threat, only leaving when O'Neill takes over. O'Neill sits as he has before, watching and waiting for one of his team to return to him. It's comforting to see such recognizable character traits, especially with such an emotionally charged drama unfurling inside Daniel's isolation room. The other main player in this drama is Pharrin. Or rather, Pharrin and the 13 others resident in his mind. The only crew member to awaken when the Stromos crashed, Pharrin is desperately trying to save the passengers before the power fails. He alone knows how to override the computer system where the consciousnesses are stored. When Teal'c and Carter discover him, they set about persuading him to remove the personalities from Daniel, and in return they will ensure the other passengers on the Stromos are saved. That sounds normal for SG-1, but events go one step further. Teal'c threatens Pharrin to ensure his co-operation; Jack threatens to cut the Sovereign out of Daniel's head; and Dr. Fraiser lets rip with one of her few Don't-Mess-With-Me moments, practically snarling at Martice: "You don't belong in that man's body and I intend to take it back!" It's this overriding concern for one person over 12 that's disturbing. It's understandable that the team has no intention of losing Daniel so soon after finding him, but they have a humanitarian responsibility to the passengers. Are these people truly dead, as O'Neill insists? Has he forgotten the events of "Entity" -- where Carter's consciousness was relocated -- so quickly? Worthy of mention: the father / son dynamic between Pharrin and Keenin adds a poignant slant to the dilemma; the oath of allegiance the passengers have sworn to their Sovereign, and how utterly unworthy of that oath he is; the difference between the confident Pharrin seen in flashbacks and the unkempt, desperate man in the present is striking; the set of the Stromos is stunning; the reaction shots of both Teal'c and O'Neill when watching the events in the isolation room add to the emotion; and Carter's ability to wrap her brain around an alien technology and, with help, find a solution is reassuringly normal. The acting and dramatic tension in the episode are so good and the Stromos so well created that they misdirect the eye from the flaws: the final resolution is too fast and too pat; the restraints Daniel wears are largely ineffective; the man who can provide the balance of moral outrage isn't actually present; and who put poor Siler in the infirmary with a bleeding nose? "Lifeboat" is a character episode, a problem-solving episode, not one for those more interested in explosions and battles. Thoughts lingered after the episode was finished because the moral implications of possibly killing whatever remained of 12 people are enormous. I'd love to be a fly on the wall when Daniel discovers the possible sacrifice.